52 km away from Ranikhet, Doonagiri is a pilgrim spot noted for its ancient Durga temple. This temple attracts great number of pilgrims, during the fair days at Navratri. 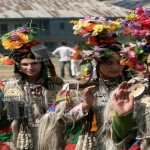 This entry was posted in Fair_Ranikhet, Uttaranchal, Uttaranchal_Fair_Festival and tagged Fair, Fair & Festival, Festival. Bookmark the permalink.